Hi all! It's nearly the end of another month already - I seriously don't know where the time goes. It's time for another photo diary post, and the highlight of my month was probably going to the Perth Royal Show. It's an annual event, but this year was the first time I've gone, in about 8 or 9 years! This year I took my little sister along - I felt somewhat guilty as I've been to the Royal Show so many times as a child, but my poor sis has only been once or twice, and mostly too little to remember much at the time. The Royal Show kind of started as a 'Fair and Cattle' Show in the 1800's - nowadays it's more than just agriculture and cattle (though it's still an integral part of the event) - there's games, rides, trinkets, and lots of displays and shows to check out. Anyways, it was kind of an expensive day (tickets alone cost a bomb), but we had heaps of fun checking out all the cute little baby animals, and going on some of the rides. We went on the second last day of the Show - somehow it wasn't as crowded as expected, which was good as it made walking around much more comfortable. The day started off fine, but it started to get cloudy and rainy later that afternoon, which might've been the reason for the smaller crowds. Haha, there was an area for kids to bounce on those ball things, but obviously no one was interested. I kind of wanted to go play on those, but I was wearing a short dress, so not a good idea! Thank you all for joining, and if you didn't win this time don't worry as I'll be sure to hold another giveaway soon. Wendy Rose, please respond to my email within the next 48 hours - I look forward to hearing from you. 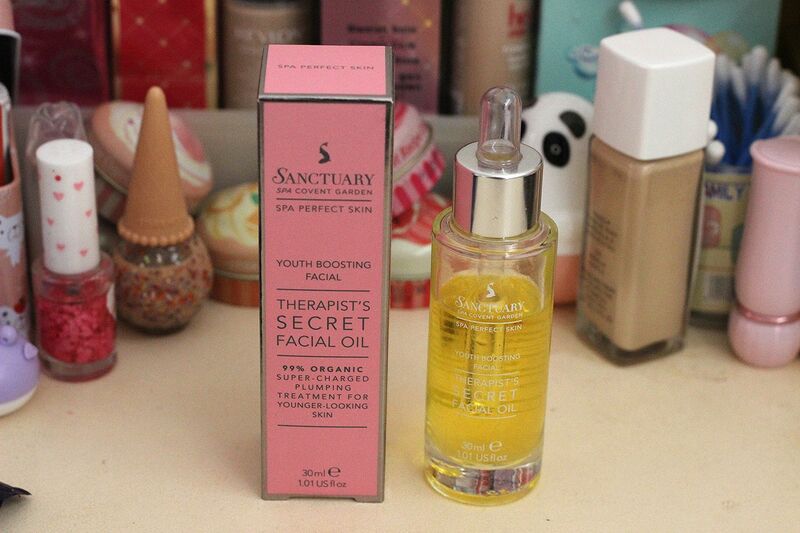 I've just finished up my first bottle of the Sanctuary Spa facial oil, so I thought it was about time I finally reviewed it. You would've seen it featured on my Skincare Routine post a while back too. This was the first Sanctuary Spa product I tried (I'm a definite convert now, especially after falling in love with their Hot Cloth Polishing Cleanser), and it's one of the most essential items in my skincare regime. Hi loves - welcome to my October/November Wishlist! First up is one of Benefit's new limited edition Holiday Sets. The only Benefit I've tried is the They're Real mascara (Benefit's sooo expensive here), but the holiday sets are reasonably priced, so I'm definitely hoping to get one. I'm currently torn between the Groovy kind-a love set, and the Little love potions set, but I've settled on Groovy, which has more products I'm interested in. It's retailing at a quite reasonable AUD69 (with a retail value of $110). Etude House x Disney XOXO Minnie Collection Released! Can you think of a sweeter collaboration than between Etude House and Disney? Etude's latest limited edition collection is none other than a collaboration with the ever stylish, Minnie Mouse! I've a soft spot for Disney (I never really grew up, after all! ), so I'm definitely indulging in this collection, after skipping the last few Etude releases. Take a look at the latest offerings! The packaging features a lot of white with black polka dots, the obligatory girlish pinks, and even a splash of red - for Minnie's cute red bow, no doubt? Hi beauties, hope you're all fab this evening! Cosmetic Love has kindly sent me a CC Cream to review for you guys, from a brand they will soon be stocking on their website, called Karadium. CC Cream has been bandied about as 'white lie' makeup for it's no makeup, makeup look and finish. Normally a white cream in formula, they contain teeny capsules inside which burst upon contact, which releases colour correcting properties that help even and adjust to skin tone. The Karadium CC Cream is packaged in deceptively plain and simple black and white, but definitely outperformed my expectations. Hi lovelies! Today you're getting a review on a cleanser that I am absolutely loving at the moment! You would've seen this featured in my Skincare Routine post, but I'll be able to give you more in depth info on it today. I started off with trying the Facial Oil as a replacement for my rosehip oil, and was so impressed I kept going back to try other Sanctuary Spa products. And now, I somehow seemed to have amassed my own little mini spa in my bathroom. Anyways, my fave Sanctuary Spa product so far has to be the Polishing Hot Cloth Cleanser. Today's post is a combined post of photo diary and haul - since I didn't manage to take very many interesting photos for a diary post, and also didn't haul too many things throughout September. So you get two for the price of one, lol.